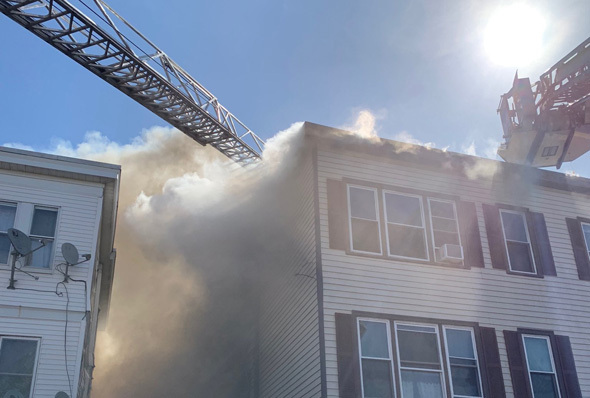 Boston firefighters are at 1527 Hyde Park Ave., near Reservation Road, for an attic fire reported around 6:45 p.m. Four residents have been displaced. 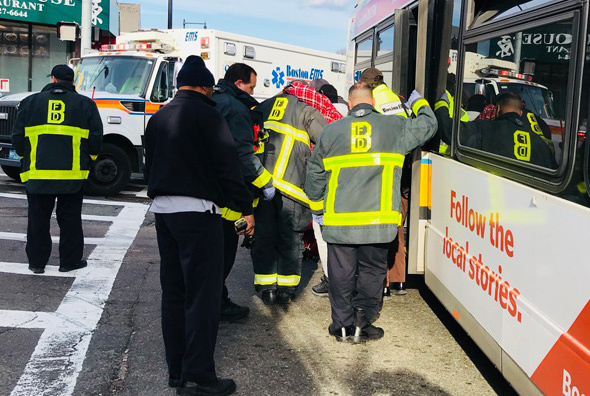 Transit Police report five people suffered minor injuries in a chain-reaction crash on Hyde Park Avenue southbound at Canterbury Street around 1 p.m. that involved a 32 bus: Read more. Roving UHub photographer Jeremy Robertson captured the newly sideways car on Hyde Park Avenue northbound near Southbourne Road near Pagel Playground this evening. 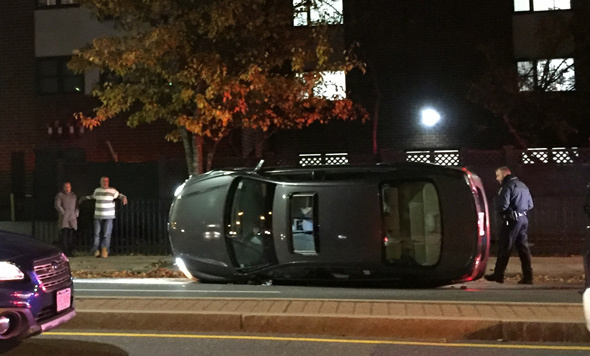 The car came to rest a few feet from a 30-mph sign. In the photo, the car is hiding a second car, parked at the curb, that suffered heavy damage to the left rear. 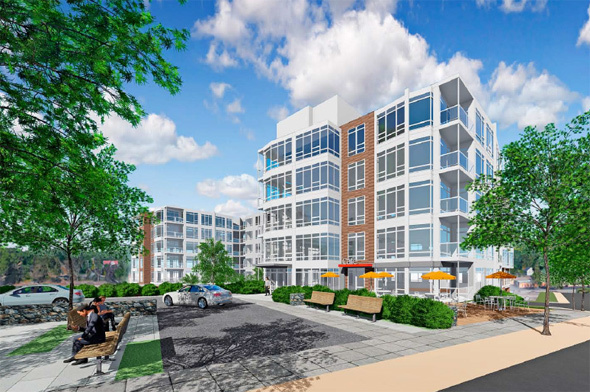 A downtown development company last week filed a "letter of intent" with the BPDA for a 305-unit housing development on a vacant parcel between Hyde Park Avenue and the Northeast Corridor train tracks at the Father Hart/Milton Street bridge at the northern edge of the Readville train station in Hyde Park. Read more. 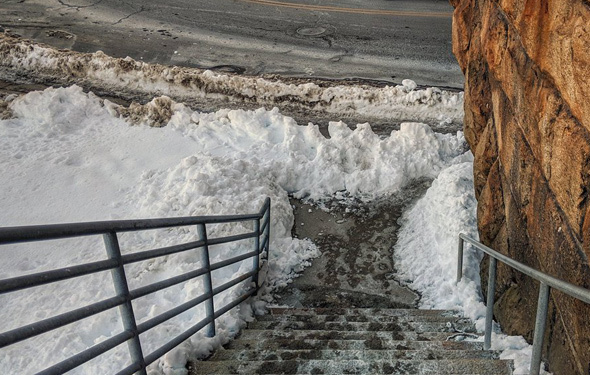 A meeting of a BPDA advisory group tonight will focus on a developers plans to change six planned three-bedroom units into twelve two-bedroom units in the next phase of its construction on Hyde Park Avenue south of Ukraine Way. Read more. Mackenson Henry, 41, was fatally stabbed late this afternoon inside La Familia barber shop, 1205 Hyde Park Ave., near the Auto Zone. 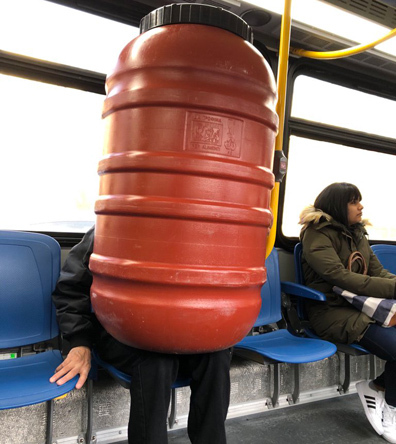 A suspect was arrested not long after. Read more. Hyde Park's Cleary Square was particularly colorful in the rain tonight, thanks to Drs. Bankhead and Groipen, two dentists who love their bright colors. 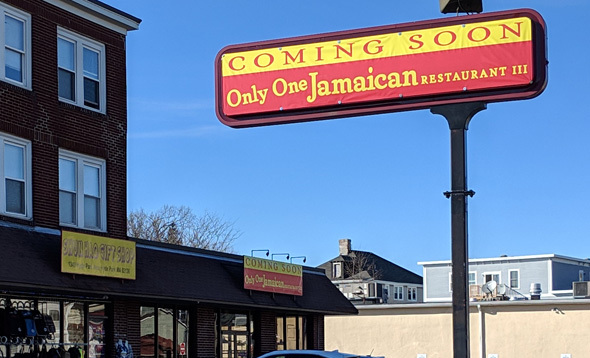 A company based in Tempe, AZ and one with principals and advisors who live in Roslindale said tonight they both have agreements to lease or buy buildings on Hyde Park Avenue just south of Metropolitan Avenue for possible medical-marijuana dispensaries. Read more. 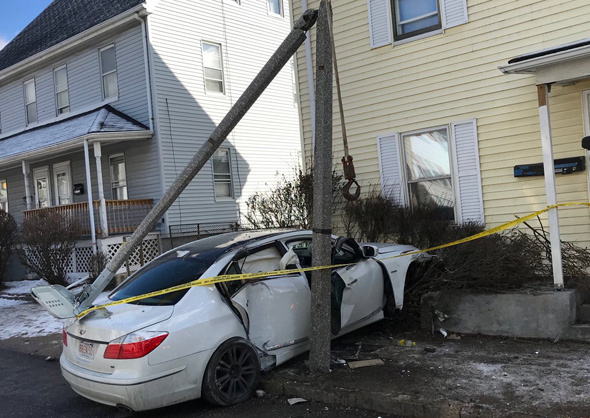 The Boston Fire Department reports that shortly after noon, somebody drove a Hyundai Genesis into first a light pole and then the house at 1482 Hyde Park Ave. Both the driver and a passenger were extricated from the remains of the car and taken to a local hospital for care. Both are expected to survive. 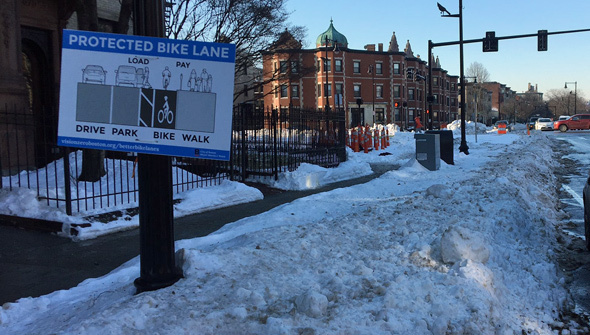 One of the new "protected" bike lanes on Beacon Street in Audubon Circle is currently protected from bicyclists, P. Cheung reports.